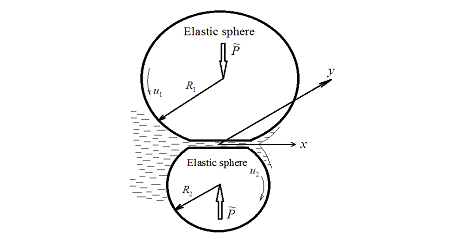 Let's consider a case of external contact of two spherical bodies divided by a layer of lubricant (fig. 6.1). is the elastic displacement of a surface of spheres (i=1,2). Displacement is considered positive if it is directed inside sphere. where are the module of elasticity and Poisson’s ratio of body respectively. where are linear speeds of movement of surfaces. To the equations (6.1) - (6.4) it is necessary to add dependences of viscosity and density of lubricant from pressure, an equilibrium condition of contacting bodies and boundary conditions for function . The decision of the given problem possesses the same properties, as the decision of a problem for infinite cylinders. Namely, at high loadings the function has two maxima of pressure. At that the maximum located on an exit from a gap, is sharp. The pressure distribution in a lubricant layer is close to pressure distribution in dry contact, except for some vicinity of a point of the second maximum of pressure. 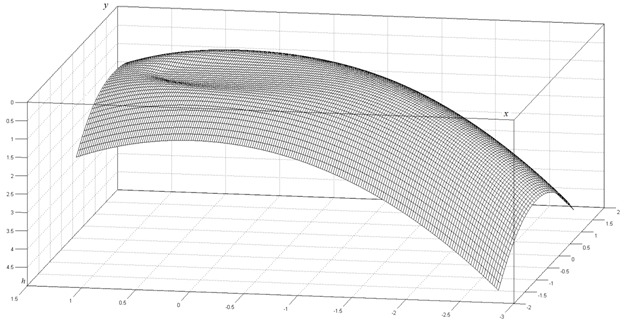 Characteristic dependences and at the high loadings which are the solution of system of the equations (6.1) - (6.4) at the viscosity depending on pressure under the law (1.18), are presented on fig. 6.2 and 6.3.